I was recently listening to a podcast from a fellow chiropractor, Dr. Kinsler, which discussed posture as a unifying tool for chiropractic as a profession. Now I’m not entirely convinced that this profession can unite around a public identity as the posture doctors, but one thing in the discussion did strike me. Dr. Steven Weiniger, who was being interviewed, discussed posture as weak vs strong and not bad vs good. Many times patients come to me and know that the reason their back hurts is because they, “have bad posture.” They report this to me as though they have a diabetes or cancer, or some disease that they have little control over. Using the term weak posture instead of bad posture implies the ability to strengthen. I have taken to using the term weak posture and strong posture with my patients and they have seemed to get the idea. Instead of assuming that they should just sit up straight which they can’t do they have begun to ask me what they can do to strengthen their posture. The biggest mistake people make when trying to improve their posture is forgetting to strengthen postural muscles. They just sit up straight then after about 20 min they’re back to slouching because their muscles cannot maintain it. I have some exercises that I’ve used for years to strengthen posture. 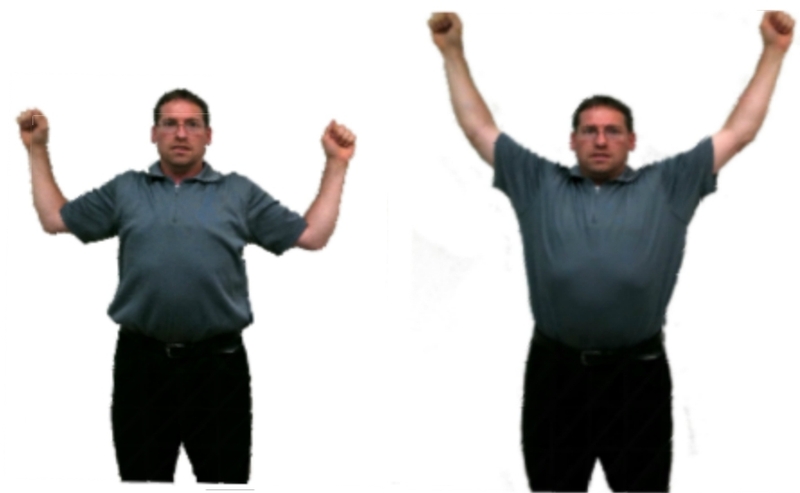 Here are two simple ones, give them a try and see how your posture improves. Bend your elbows 90 degrees and raise them out to the sides so your hands (palms facing out) are at shoulder height. Keeping your arms pressed into the wall, lower your elbows as far as possible. Hold for a second, squeezing your shoulder blades together. Slide your arms up the wall as high as they will go without losing contact with the wall. When you start to lose contact, bring your arms back to the starting position. These exercises are for informational purposes and are not intended to be a substitute for examination, diagnosis and treatment by your physician chiropractic or otherwise. This entry was posted in Chiropractic in General on August 8, 2011 by cmnacnud.